The spirit itself has a delicate green/yellow hue which suggests some sort of post distillation process. One possible explanation for color is that there are some ingredients macerated in the spirit after distillation, which would firstly, allow aromatics which are normally lost because they cannot be distilled to remain, and also might allow tannins/oils to make it into the final product. But I’m merely speculating here. The color is unique, and doesn’t seem to suggest barrel aging, and what we do have about the process suggests that we might be entering into something altogether different here in the gin world. The nose certainly highlights some of the piney/resiny notes of juniper. Hints of maple syrup and cedar add depth between a breathy mix of pine sap, sagebrush and bitter orange zest. The aroma bears to mind a suggestive portrait of sagebrush playa with the terpenic aroma of arctic air. The palate is oily and thick, with heavy, waxy, and herbaceous notes. The palate is rich with notes of pine resin, perhaps a bit more spruce/pine than it is immediately juniper. The finish suggests a more traditional underlying gin approach, with some hints of licorice, coriander, and angelica, with woody notes. Certainly this camphorous, herbaceous, pine laden finish is suggested by the process, but I think that on the exceptionally long, and quite warm finish, that touch of bitter orange I’m getting might be the most surprising of all, and perhaps, through whatever process which is lending that effect, is the key to the balance that makes this such a unique but intriguing gin. A lot of the character, in particular that resiny, juniper/pine herbaceous reminds me of other gins which use some juniper post-distillation; however, again that’s merely an educated guess. It doesn’t seem altogether too far away from Bendistillery’s bathtub style gin; however, it certainly does stand on its own. This is an intriguing product; however, in terms of cocktails I found it to be more of a specialty gin than an all-around workhorse. Negroni: rich, spicy, brilliantly sharp with a lot of juniper character, even at the sacred 1:1:1. Excellent, recommended. Martini: a good herbal Vermouth is a fantastic pair here, and while I like the recommended Lesson No. 1 on the back of the bottle (2 oz gin; ¼ oz. olive juice; ¼ Orange Liqueur), I vastly preferred a 7:1 with Quintinye Royale and the Alaska Cocktail. This is a gin for Martini lovers though, truth be told. Gin and Tonic: I wanted to love it, but I found it to clash with quinine and the sweetness lent it a really odd half air freshener/slightly cleaning solution palate. The same went for the Gin Fizz, It just doesn’t work. In short, New Deal Gin No. 1 is described as a “sipping gin,” and I have to say I think that through and through, that’s where this gin shines. Mixing seems to be a mixed bag, but if you’re a fan of heavy juniper and pine notes, and prefer your gins neat or in Martinis, this gin should be a “must try.” I enjoy this quite a bit, but I’m aware that this is a niche gin. 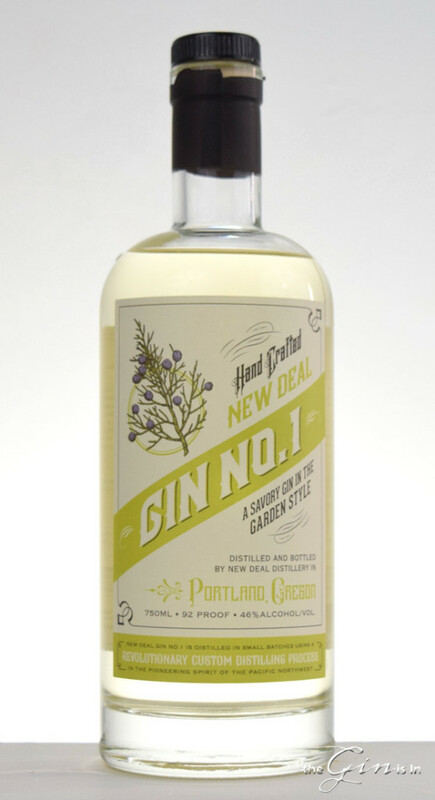 New Deal Gin No. 1 is perfect for gin-lovers who are looking for a good Martini Gin or a good sipping gin. The thick, herbaceous juniper and pine resin notes make this a unique, muscular gin which is certain to appeal to folks who think that there’s something missing in what most gin distillers are able to get out of juniper. It’s all here. But for fans of lighter styles, contemporary styles, or those looking for a good Gin and Tonic, those drinkers might be advised look elsewhere. An excellent, but niche, gin. Recommended within its style. *From the New Deal Distillery website.